Past and present editions of Osamu Tezuka's Jungle Emperor Manga from Japan. Listed below are various Jungle Emperor manga collections from over the years. These are all from Japan, in Japanese. There have never been Kimba/Jungle Emperor books published in English. Click each picture to see inside the book. Jungle Emperor Manga - Deluxe Softcover Edition! A high-quality version in a large size. 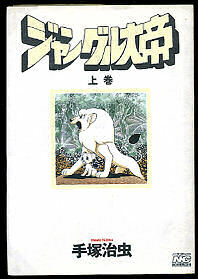 This collection of the original Jungle Emperor manga was published in 1990. Each volume includes a dust jacket and measures 8-1/4 inches high and 5-3/4 inches wide, with the first 5 pages in each volume in full color. These books are out-of-print. Offered here are complete sets of 2 used books in excellent condition. Clean, with tight binding, and just a bit of rubbing or edge wear on the dust jackets. Volume 1 contains 260 pages. Click the picture to see a sample page. IN STOCK. which includes FREE SHIPPING to anywhere. Volume 2 contains 270 pages. Click the picture to see a sample page. Jungle Emperor Manga - Pocket Softcover Edition! This set is the complete Jungle Emperor manga in a small format. Each volume measures 6 inches high and 4-1/4 inches wide. All pages are in black and white. Volume 1 contains 264 pages. Click the picture to see a sample page. SOLD OUT. Volume 2 contains 280 pages. Click the picture to see a sample page. Jungle Emperor Color "Sunday Comics"! 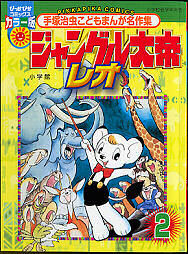 Color Japanese manga that expands the story of Jungle Emperor. 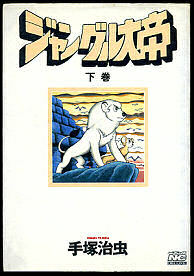 This book contains original Jungle Emperor/Kimba stories that were written at the time of the original TV show. These short stories are not included in the manga sets above. This book measures 7-1/2 inches high and 5-3/4 inches wide, and is 96 pages long. Every page is in color, and every story begins with a full-page picture, which are not often included in reprint editions of these stories. This book is brand new. 6 stories on 96 full-color pages. IN STOCK. This page was updated on August 6, 2012.